In today’s day and age, drivers across the country can expect to haul anything and everything. From livestock to refrigerated loads to machinery for large-scale devices, one’s trucking job can find a driver carrying cargo for nearly any need or any industry. One of the largest needs in terms of cargo, however, is the automobile industry. Just as food, produce, animals, and other consumer goods must be shipped across the nation, automobiles are always in demand. When a shipment of a new model or series of car needs to be sent to a dealership, it’s up to a commercial driver to ship the vessels of their non-commercial counterparts out to those who need them. A car hauling job can be incredibly lucrative and advantageous for the Class A driver, but it may also be one of the more challenging types of trucker job opportunities one can take on. Who Will I Work With When Hauling Cars? A car hauling job may find a driver working for a variety of different entities, all of whom need their particular brand of automobiles shipped to various locations. No matter who a trucker partners with, they are bound to be in high demand to meet the needs of car sellers as well as car shippers. Some drivers may work closely alongside an automobile manufacturer to send their product out to various outlets such as dealerships and car emporiums that need to stock their lots with the latest and greatest cars. Reports note that across the state of Texas are the most dealerships per any state in the union, ultimately leading towards what may mean a seemingly never-ending supply of cars. Other truckers may find a truck driving job opportunity working with more niche car distributors such as exotic cars, classic automobiles or rare models that go to auction. Considering that many of these cannot or should not be driven until they are at a showroom, gallery, or the purchaser’s home, experts in the field of commercial transportation are in great demand. Take the various automobile museums across California – the majority of these cars arrived by way of a car hauler. What Types of Lanes Do Car Hauling Jobs Run? Just as the type of sources of car distribution may vary, so will the runs that a trucker interested in this type of work vary. For some jobs, it may be necessary to transport automobiles for great distances over the map. A manufacturer in Michigan may need to send products from their plant all over the map, requiring a driver to complete a great deal of long haul deliveries. Other clients may be less demanding in the distance one must travel, but may require a greater frequency of trips. It may be the case that exotic cars or autos up for auction must be shuttled from one local area to another, or that a car on display in multiple locations will need to be transported from one spot to another. There is no hard and fast rule as far as auto transportation goes, and just as any cargo must be accounted for, there will be a wide array of route options and runs that a driver can choose from when dealing with this particular type of freight. What Duties Do Car Hauling Jobs Entail? No matter how many cars you are hauling or what length of time a driver is required to haul cars for, a professional trucker will still be required for the job. In this sense, all of the duties assigned to a driver such as the ability to assess the quality of a product before and after its transportation is paramount to the operation. Truckers in this position will learn how to secure cars and how to trek through various types of weather and landscapes, just as other drives may learn how to secure a flatbed load or how to properly sanitize and clean a reefer trailer. Safety is also of extreme importance to a car hauling position, just as any commercial transport position must see. Drivers would do best not to think of their job differently due to the nature of the cargo, but to think of it terms of other similar trucking positions, where operation must be diligent and paired with a profound sense of responsibility. How Well Are Auto Haulers Paid? 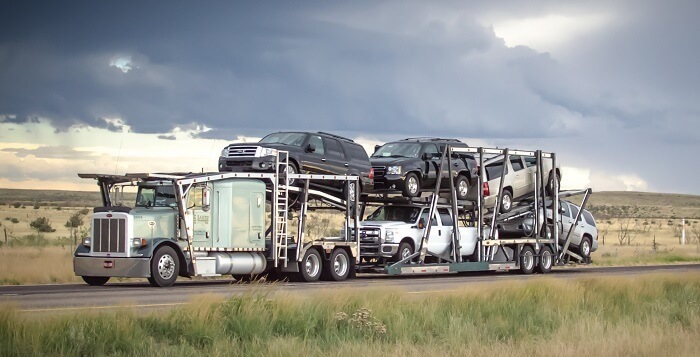 Car hauling is considered a specialized type of freight to drive and therefore those who drive it around the nation may see some excellent pay rates attached to it. According to reports from truckers around the lower 48, some jobs involving auto transport may pay up to $70,000 per year for the average routes that one might encounter. In the same vein, some of the top performers in the auto hauling field have reported up to $82,000 a year - likely for a packed schedule and runs that keep a trucker incredibly busy. To this end, many drivers who work in this capacity typically report a company job that also provide benefits such as medical benefit packages and financial security options such as a 401 (k). Any trucker will tell you that no freight is easy to haul – all types of loads present their own set of unique challenges. Considering that cars are often in high demand and they are modes of transportation (i.e. watch out for those wheels!) they may be even more temperamental than the human passenger. Consider the following challenges reported by drivers when taking cars from Point A to Point B. Damage to Cargo: When cars are on a car-carrying trailer, generally speaking they are secure, but the real potential damage lies in the outside weather conditions that may impact uncovered freight such as cars. Drivers should take extreme caution when driving through heavy rain, snow, or heavy winds. Damaged items are never looked upon favorably by any party, so avoiding any harm is paramount. Inconsistency in Freight Sizes: Trucking is always variable on several factors, and there will be times when it may seem that an entire dealership needs to be stocked and other times when only a few autos need transport. Drivers should not be discouraged by inconsistency however, for there are a great deal of instances throughout a calendar year where cars needed for various sales, trade shows, exhibits and the like. Other smaller and less frequent challenges that some drivers have reported are "lot lizards" or other people who see these valuable cars and want to sneak a peek at the impressive machinery, or other drivers in parking lots who may harass truckers and try to be nosy about the Corvette they may be hauling. What Do I Need For An Auto Hauler Job? In many cases, this type of trucking job does not require drivers to have any additional endorsements or qualifications in order to secure a car hauling position with a company. Many recruiters will simply look at a candidate’s overall experience to assess whether or not they are a suitable fit for the job. Some drivers do report that preference in this field was given to them due to having some towing experience in their background or a previous job that dealt with oversized loads. It would also not harm an applicant to have some background in dealing with automobiles in some capacity, though one does not need to be a mechanic. One should think in these terms – any extra qualifications that you would personally consider to be positive for a job candidate for these types of jobs are likely ones that a recruiter would consider positive as well – even if it is just knowing how to change a tire! Am I Ready to Start A Car Hauling Position? If you are a driver who is tired of the usual routine or typical cargo fare, a job hauling automobiles may be the perfect career decision for you. Those driving cars have the opportunity to transport what is arguably some of the most fascinating and eye-catching items around. Spectators and non-truckers on the road are often in awe of those driving the latest model of BMW or classic cars on their way to a Barrett Jackson car auction. If you are the type of individual that enjoys hauling freight that is generally beloved by all, consider getting behind the wheel for a car transporter and seeing where the road takes you.